By Radu Iosif on 03/19/14 • Leave a comment! Laptop cases and bags come in all shapes, sizes, materials, and designs. We have seen some banal, quirky, fun, and weird ones, but surprisingly not so many serious classic looking ones. The folks at WaterField were kind enough to send us their retro-looking CitySlicker case [Editor’s note: I like to think that this is a bag, and not a case. Cases usually let you use the laptop while it’s still inside. This does not. -Ed. 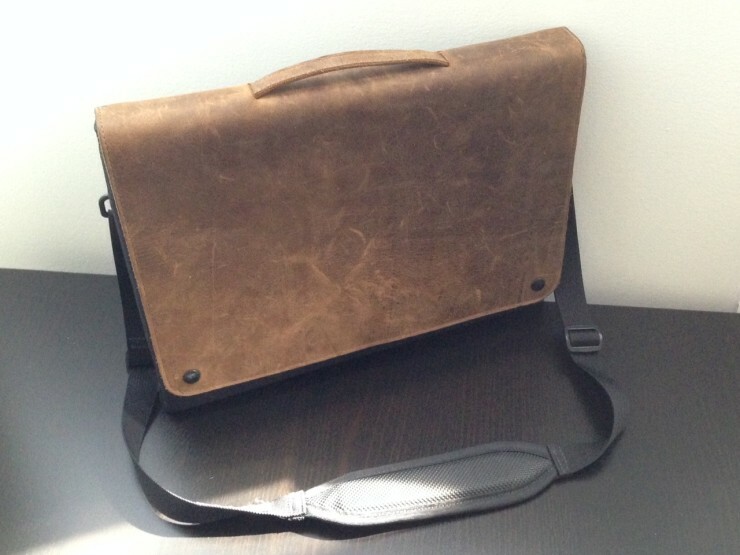 ), designed specifically for the 13” MacBook Air. Right off the bat, the case emanates quality and style, especially because of its generously thick dual-leather flap, which can come in 5 different (rather serious) colors. On top of this, the unit we looked at was the upgraded CitySlicker that came with a leather grab handle, as well as a shoulder strap, giving it an even more classic high-end look. Besides the leather flap and a neoprene-reinforced bottom, the case has 3 layers of protection on the inside: a padded liner, neoprene, and impact-resistant plastic.